Precision, multi-axis positioning solutions that are intended to work in an industrial environment must be viewed as an overall system, because their performance does not only depend on the mechanics and the type of drive selected, but also on their control. An industry-capable motion controller must synchronise the individual axes, move according to multidimensional motion profiles, respond quickly to changing servo-control parameters and allow convenient integration into the higher-level automation environment. Therefore PI has acquired the majority shares in ACS Motion Control, a w leading developer and manufacturer of modular motion controllers for multi-axis drive systems. This was an important requirement for enabling PI to supply customised complete systems for industrial applications with the highest demands on precision and dynamics and also add its extensive experience in high-end projects for industrial applications intended to combine precision, productivity, and reliability all over the world. The ACS motion controllers are also EtherCAT masters, responsible for managing all the network nodes of the EtherCAT network. The controllers are modular by design, interchangeable, scalable and communicate with the host PC of the machines via various Ethernet protocols. Universal control module (UCM) drives are responsible for the servo control. All current, velocity and position loops are processed at a frequency of 20kHz regardless of the numbers of axes, which is a pre-requisite for achieving high synchronisation and dynamics with minimal errors. 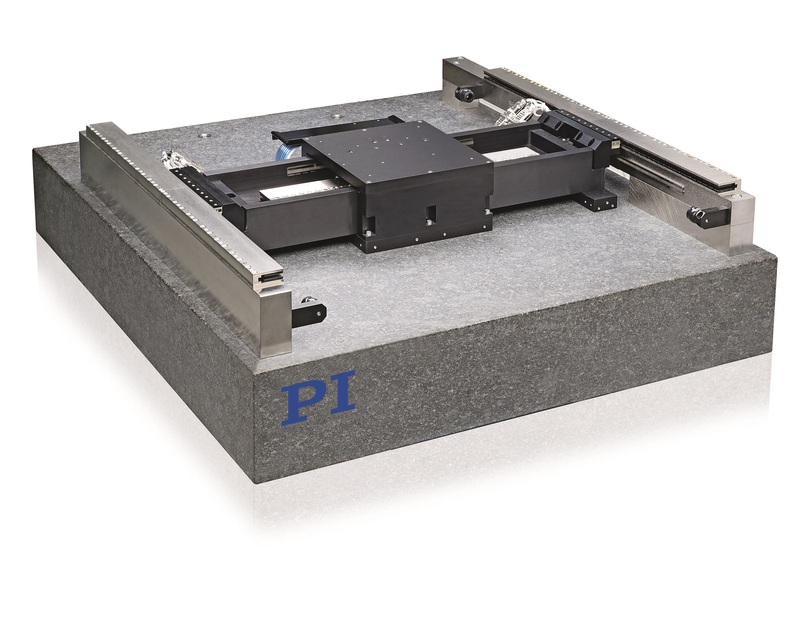 In conjunction with the linear and rotational axes, parallel kinematics and planar scanners, the controllers are part of a customer-specific customer-selectable complete system from PI. The motion controller systems optimise standstill jitter and settle times by using intelligent control algorithms, such as ServoBoost, as well as by profile shaping for example, which prevents vibration. Proprietary technology such as NanoPWM and the DRBoost feature makes it possible to achieve a dynamic range higher than 100,000:1 and as a result to achieve nanometre level of tracking errors while scanning a wafer and standstill jitter at a sub-nanometre level for applications in metrology. The integrated 3-DOF compensation of positioning errors and yaw compensation for gantry solutions make it possible to realise applications with the highest demands on accuracy. An example of this is the air-bearing two-axis linear stage that was developed for wafer inspection. Over the entire travel range of 500 x 1,000mm, it operates with a straightness/flatness of ±10nm per 10mm travel range. To achieve exact right-angled alignment, the motion controller controls axis yaw via the X axis. The controller also dampens oscillation actively using the profile-shaping algorithm. The air-bearing planar stage, which is moved by magnetic direct drives, is modular, which means that the strokes are scalable and, depending on the positioning accuracy required, allows the installation of various different encoders. The stage carries loads of up to 24.5kg. The wear-free air bearing not only ensures extremely level motion, but also a long lifetime. The EtherCat interface of the controller also allows the position system to be easily integrated into a higher-level control environment. Doris Knauer is with PI.